Currently, the Artvin-Cerattepe mine case, the biggest environmental legal case in Turkey, constitutes one of these battlefields, where the lives and livelihoods of many are being put in danger by copper and gold mine prospecting in the region. During the final hearing of the case on September 19, the litigant lawyers demanded recusal and abandoned the court-room amid extensive security precautions. “We are under immense pressure,” claimed the legal representative in the case of Bedrettin Kalin. The movement against the controversial mine construction has been going on for more than twenty years now. Despite several court decisions ordering the abandonment of the mine project based on the right to a healthy, balanced environment, the company was able to obtain new environmental impact assessment reports (EIA) and reclaim the project. Hence, the case is significant from many angles; the ability of the company to obtain a new EIA every time, the inability of the Turkish legal structure to put an end to the project, and the everlasting determination of the local people involved in mobilization against it. Cerattepe’s history of struggle lasting for more than twenty years and the fact that the mine is still not operational makes the battle a landmark environmental case for analysts. Located 30 km inland from the Black Sea, Artvin is a city in the north-eastern part of Turkey with a population of around 168, 370. It is part of the Caucasus Ecoregion, one of the most biologically rich and culturally diverse zones in the world. It is home to 1,268 different species, 199 of which are endemic to the area. Both due to its rich biodiversity and unique natural beauty, Artvin has enormous eco-tourism potential, comparable only to the Swiss and French Alps. Nevertheless, it only has one, neglected skiing area, the Kafkasor Recreation Zone. The area is very rich in raw materials, including gold, silver, zinc and copper reserves. Field explorations at the site were launched by the General Directorate of Mineral Research and Exploration (MTA) in 1986. In its concluding report, the MTA suggested that no economically significant source was detected in the region. In 1988, however, Öner Gürses, a close relative of an engineer working at MTA, obtained the preliminary exploration rights in the region for a very low cost, around 200 Turkish liras. A year later, he sold the exploration license to Cominco, a Canadian company, for an amount around 6 trillion Turkish liras. Initial objections were raised against Cominco during its exploration of the site in 1994. The company drilled around 560 wells in the region, and during this process, local water was contaminated by heavy metals and hazardous chemicals. Consequently, a few cows died, and samples taken from the cows to be investigated were then lost. This incident raised suspicion among the local people. Cominco responded to these concerns by organizing a panel on gold mining, together with the Municipality of Artvin. Despite these efforts, the locals became even more worried about the environmental consequences of gold mining after this conference. Subsequently, in 1995, the Green Artvin Association was established. The Association invited several academics to Artvin in order to carry out a scientific investigation of the area and also to reassure the public about the effects of gold mining. Green Artvin Association held its first demonstrations against the mine in 1997. The group collected around 10,000 signatures on petitions prepared in 1997 and again in 2002. Finally, in 2005, a lawsuit was filed against the project, and in 2008, Rize Administrative Tribunal revoked the mining license. The biggest achievement for the movement came in 2009, when the Council of State nullified the licenses. Nevertheless, in 2011, the Ministry of Energy and Natural Resources modified the mining law again. The new law enabled the Ministry to grant a new operation license to the Cerattepe mine, along with 1,342 other mining sites in Turkey. In the tendering process, Ozaltın company obtained the license and transferred it to Etibakır company owned by Cengiz Construction Company. Subsequently, protests were sparked again. In 2013, another lawsuit was filed against the company by 281 people. Until the Rize Administrative Tribunal annulled the company’s EIA in January 2015, the protestors prevented the company from cutting trees and starting to transport equipment and trucks to the site. Following the decision of the Rize Administrative Tribunal, the company carried the case before the Council of State for appeal. However, at the same, the company obtained another EIA before the appeal decision. The Council of State approved the order of the local administrative court to nullify the licenses of the company. However, that decision of the Council of State stemmed from the previous environmental impact assessment report of the company. Therefore, this time, local people from Artvin filed another lawsuit against the company, bringing together 751 participants and 61 attorneys, making this the biggest environmental legal case in Turkey’s history. They kept surveillance over Cerattepe for 245 days by staying in a small wooden cottage until police intervened. Currently, the road to Cerattepe is blocked by the police. The decision over the recusal demand is scheduled to be announced in a month. 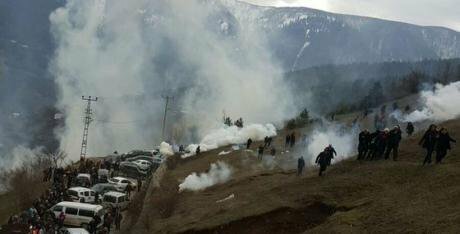 The Artvin-Cerattepe struggle clearly shows the inability of the Turkish legal system to be a forum through which the environmental rights of people can be implemented. In addition to the incompetence of the Turkish legal system, this case illustrates how twenty first century power politics is being played out in the arena of environmental projects. Actually, famous power politics concepts of international relations no longer apply to state-to-state relations. In today`s world, where capital is globalized, power politics is the concept defining the battle between globalized capital and activists with transnational civic values. Who will win? It will be the activists – but only if the world stops praising capital in good time.